The work of John Head is a rare example of early Philadelphia furniture for which there is clear documentation. Head’s account book—one of the earliest surviving joiner’s account books from colonial America—was fortuitously saved, making it possible to attribute furniture to him when there is also a clear provenance. This dressing table and high chest were commissioned by Caspar Wistar (1696-1752), one of the wealthiest men in Philadelphia during the mid-1700s. Wistar amassed a sizable fortune primarily as a land speculator. Wistar also operated a brass-button manufactory and in 1739 established what would become the first successful glassmaking operation in British North America. He commissioned these pieces from Head shortly before his marriage in 1726 to Catherine Jansen. Unlike the veneered furniture then made in England, Head’s work uses the figure of the wood (here, black walnut) to achieve a decorative effect. This escritoire is the earliest known signed and dated piece of furniture made in Philadelphia. Built in 1707 by Edward Evans, it is closely related to English furniture of the same period, with the largest difference being the use of locally available materials. Evans was raised in West New Jersey and made furniture for many prominent Philadelphia families, including those of William Penn, Isaac Norris, and James Logan. This marble-topped sideboard table was carved by Martin Jugiez around 1765, when he was in partnership with cabinetmaker Nicholas Bernard of Philadelphia. Little is known about Jugiez, including where he trained and even the correct pronunciation of his name. His distinctive work blurs the line between craft and sculpture, yet no examples have been identified from before he arrived in Philadelphia, apparently fully trained in his art. Much of Jugiez’s known work was architectural carving for public buildings and the homes of Philadelphia’s elite. For years this table was mistakenly attributed to Ireland or England, as both the overall form and the carved ornament, particularly the massive lion’s mask at the center of the apron, were highly unusual for colonial America. Only after painstaking comparison of the carving on the table with architectural woodwork at Mount Pleasant, Cliveden, and St. Peter’s Church did the attribution of the table to Jugiez become possible. Most of the surviving examples of early Philadelphia furniture belonged to prominent city residents. 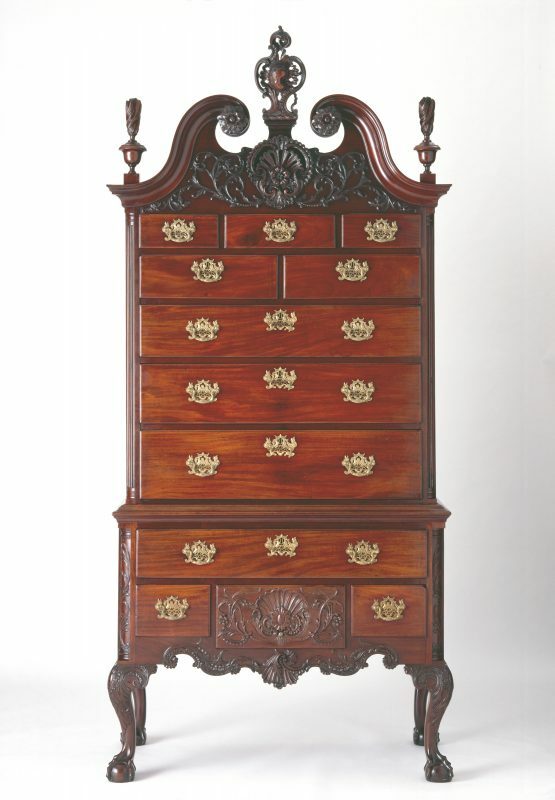 This mahogany high chest was acquired by Michael Gratz and Miriam Simon in 1769. A Jewish immigrant from Silesia, Gratz moved to Philadelphia in 1759 to join his brother, Bernard. They established a lucrative transatlantic trading business. This high chest was made about the time of Michael Gratz’s marriage in 1769 to Miriam Simon, daughter of Joseph Simon, another Jewish merchant. 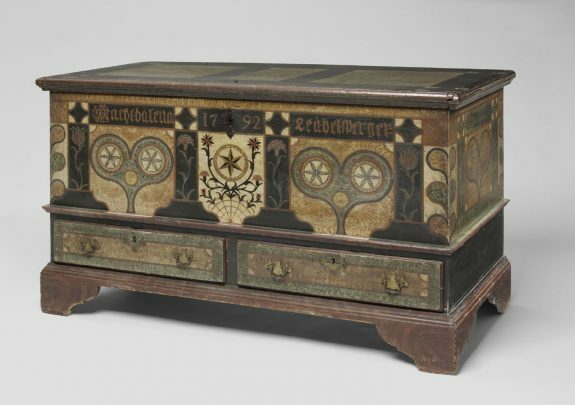 German immigrants brought their highly decorated furniture traditions to Pennsylvania, including painting, carving, and inlay. This particularly intricate painted chest was made in 1792 for Magdalena Leibelsperger, who lived along the western edge of what is now Lehigh County. It features compass work star and heart motifs as well as flowers and sponged decoration. The owner’s name is painted across the top in German Fraktur lettering. In addition to the distinctive outer decoration, construction details are often another sign of Germanic craftsmanship including the use of wooden pegs rather than nails to secure drawer bottoms and moldings and dovetails with thin horizontal wedges driven into the endgrain to make a tighter joint. German-born cabinetmaker Daniel Pabst spent most of his professional career in Philadelphia. Pabst’s work was often massively scaled and reminiscent of architecture more so than furniture. Indeed, he worked with renowned Philadelphia-based architect Frank Furness on a number of his most famous and intricate works. 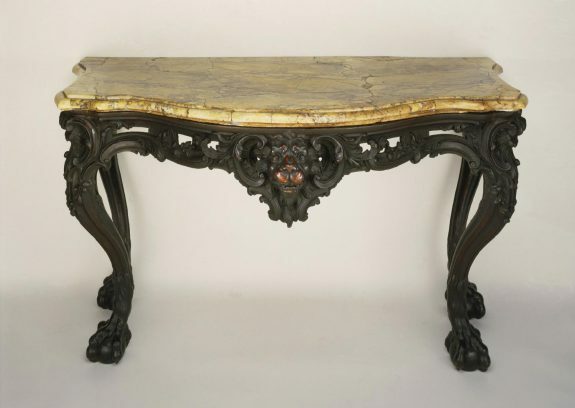 Pabst’s large, hand-carved pieces were popular among the New York City and Philadelphia elite, and he was commissioned to make custom interiors for Theodore Roosevelt Sr., father of the future president, and historian Henry Charles Lea, among others. 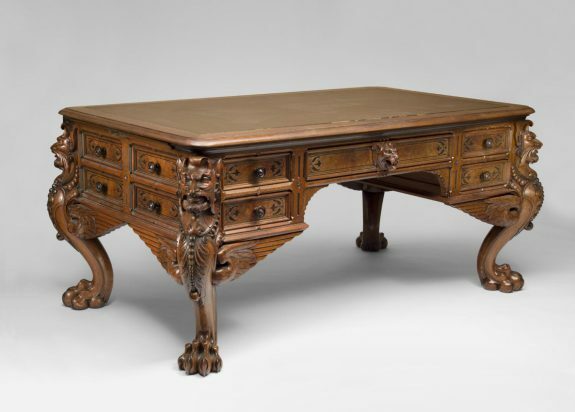 This c. 1880 walnut partners’ desk is attributed to Pabst and features expertly carved winged figures at each corner terminating in lions’ paw feet. Philadelphia native Wharton Esherick originally trained as a painter at the Pennsylvania Academy of the Fine Arts. His interest in woodworking began in 1920, when he started carving designs into frames for his canvases and quickly progressed to larger wooden sculptures and furniture pieces. By the late 1920s he was devoted to creating Expressionist furniture pieces with geometric and prismatic forms. 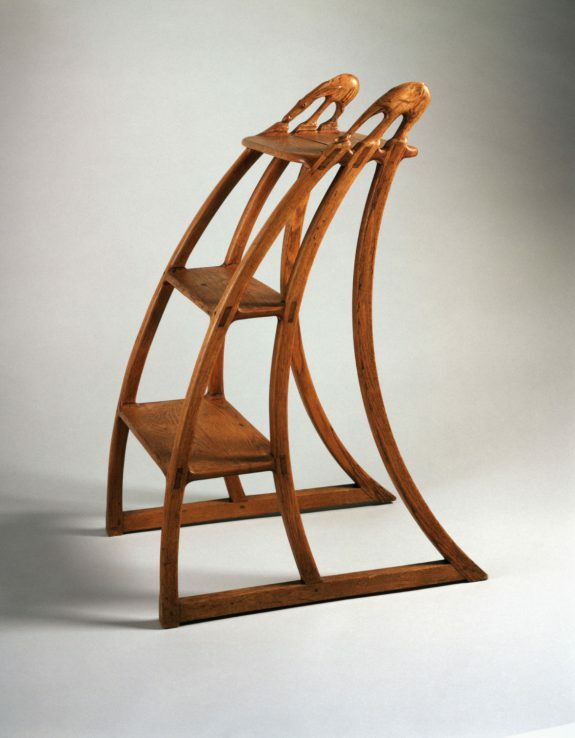 His later works, like this stepladder from 1936, show Esherick’s transition into the natural, curvilinear forms that would become synonymous with his name. This piece was created for the music room of Judge Curtis Bok’s home in Radnor, Pennsylvania, just one piece of an extensive installation commissioned by Bok. The finials atop the side rails take the form of an elephant and a donkey, adding an air of whimsy to the piece. Esherick’s work is often cited as the bridge between the early twentieth-century Arts and Crafts movement and post-World War II modern furniture making. Small chests known as spice boxes were a popular furniture form among Quakers in the Philadelphia area during the early-to-mid 1700s. 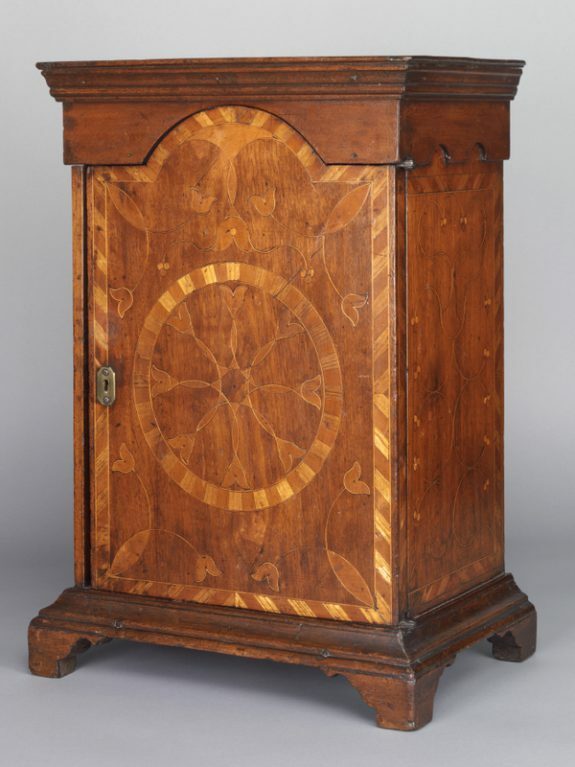 These pieces typically consisted of a cabinet with a lockable door, behind which was a series of small drawers used for storing valuables such as coins and spices. 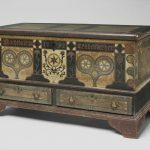 In Chester County, spice boxes and other types of furniture were frequently inlaid with stylized, naturalistic motifs now known as line-and-berry inlay. The use of various woods such as walnut, cherry, sumac, and holly created a polychrome effect. This example was made in the Nottingham area of southern Chester County, where herringbone borders were sometimes used in addition to line-and-berry inlay. 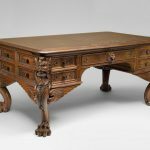 From the founding of Philadelphia in 1682 until the late 1800s, a vibrant community of cabinetmakers plied their skills alongside specialists in carving, chair making, and turning. Others who worked with wood included carpenters, coopers, shipwrights, and wheelwrights. 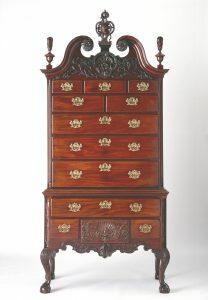 These tradesmen were as diverse as the city itself, and their complex webs of language, ethnicity, religious beliefs, family ties, and transatlantic styles helped shape the region’s distinctive furniture traditions and make Philadelphia one of the foremost centers of cabinetmaking in early America. Outside the city, many locally distinct vernacular traditions developed, particularly in areas of heavily German and Quaker settlement. The Philadelphia furniture industry prospered through the 1800s but then sharply declined by the mid-1900s due to the rise of mass-produced, inexpensive furniture from both domestic and global manufacturers. It never entirely died out, however, as some woodworkers found success making handcrafted studio furniture and have continued Philadelphia’s longstanding cabinetmaking tradition. The earliest craftsmen in “Penn’s Woods” had ready access to an abundance of native trees suitable for cabinetmaking as well as imported tropical hardwoods—especially mahogany—due to Philadelphia’s role as a major port city. Walnut, cherry, and maple were the primary native woods of choice, with tulip poplar, pine, cedar, and oak frequently used as secondary woods for drawer sides, bottoms, back boards, and the like. From these materials came an astonishing range of products made by more than 440 cabinetmakers, joiners, chair makers, carvers, carpenters, and turners who were active in Philadelphia and its environs between 1682 and the 1760s. Furniture, account books, and drawings survive to document cabinetmaking during Philadelphia’s first decades. Most workshops were fairly small at this time, run by the master cabinetmaker with the assistance of several apprentices and possibly a journeyman. The earliest known signed and dated example of Philadelphia furniture is an escritoire or desk-and-bookcase dated 1707 and stamped by Edward Evans (1679-1754). Raised on a farm along the east bank of the Delaware River in West New Jersey, Evans completed his apprenticeship in 1704. His clients included William Penn (1644-1718), who paid him £7 for making a chest of drawers, and prominent merchants including Isaac Norris, James Logan, and William Trent. One of the best documented joiners of this early period, John Head (1688-1754), kept an account book that can be linked to surviving objects, including dressing tables, high chests, and clock cases. In a notebook, English joiner John Widdefield (1673-1720), who immigrated to Philadelphia by 1705, documented the production of items such as spice boxes as well as instructions on everything from sharpening tools to making coffins and clock cases. Many of the cabinetmakers who worked during this early period trained their sons in the trade, in some cases establishing multigenerational woodworking dynasties. For example, woodturner Jacob Schumacher (Shoemaker) Sr., a Quaker and one of the earliest settlers of Germantown, emigrated from Mainz, Germany, in 1683 and moved to Philadelphia about 1715. In 1722 he bequeathed his woodturning tools to his son Jacob Shoemaker Jr. (1692–1772), a joiner/turner whose son Jonathan Shoemaker (1726–1793) became a cabinetmaker. Another multi-generational workshop originated with joiner Joseph Claypoole (1677-1744), and extended to his sons Josiah Claypoole (1716/17-1757) and George Claypoole (1706-93) and grandson George Claypoole Jr. (1733-93). 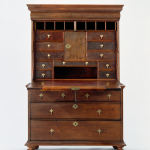 Philadelphia’s cabinetmaking trade expanded greatly during the mid to late 1700s, leading to increasingly sophisticated craftsmanship and specialization. 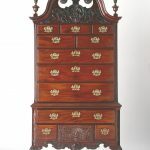 Highly skilled emigré carvers helped elevate Philadelphia furniture and architectural woodwork to new heights, and the work of London cabinetmaker Thomas Chippendale (1718-79), who in 1754 published The Gentleman and Cabinet Maker’s Director, influenced many designs. Two of these craftsmen, Hercules Courtenay (c. 1744-84) and John Pollard (1740-87), worked in the shop of Benjamin Randolph (1721-91), one of the foremost cabinetmakers in colonial Philadelphia. His shop was located on Chestnut Street, identified as the Sign of the Golden Ball beginning in 1769. 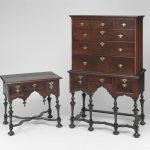 Randolph’s shop produced both the lap desk on which Thomas Jefferson wrote the Declaration of Independence and, together with Thomas Affleck (1740-95), the ornate furnishings for the Philadelphia town house of John Cadwalader (1742-86). Other prominent city woodworkers included Samuel Harding (?- 1758), Nicholas Bernard (?-1789), Martin Jugiez (?-1815), Jonathan Gostelowe (1744-1806), and Daniel Trotter (1747-1800). Some of the most celebrated pieces of Philadelphia furniture were crafted during this period, including a high chest made in 1769 for Michael Gratz (1740-1811) and his wife Miriam Simon (1749-1806), prominent members of Philadelphia’s Jewish community. Made of highly figured mahogany with ornately carved foliate-and-shell motifs and pierced chinoiserie brasses, the Gratz high chest is an extraordinary example of Philadelphia furniture. Its elaborate scrollwork, sinuous curves, asymmetrical designs, and naturalistic motifs including shells and flowers, epitomize the rococo or late Baroque style that was popular in America during the mid to late 1700s. Philadelphia’s diverse furniture makers—which included English Protestants, German Lutherans, French Catholics, Welsh Quakers, and others—developed a furniture tradition that was more regionally specific than it was to any one ethnic group. They generally conformed to a standard design aesthetic rather than developing their own more individualized expressions. For example, Philadelphia Chippendale chairs typically have certain construction features such as side rails that are tenoned through the rear stiles and two-part vertical glue blocks—regardless of the maker’s ethnicity. 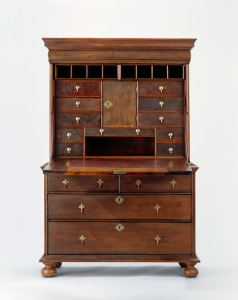 Outside the city, many cabinetmakers drew on Philadelphia styles, but others developed highly localized forms of decoration and construction techniques. In Lancaster County, for example, Pennsylvania German woodworkers inlaid some of their furniture with molten pewter or sulfur. 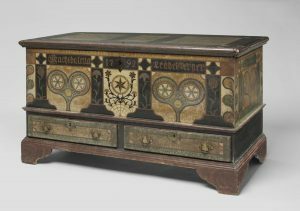 Other craftsmen of Germanic heritage made painted chests decorated with images of flowers, birds, and even unicorns and camels. Typical Germanic construction techniques included the use of wooden pegs (rather than nails) to attach drawer bottoms and moldings as well as the insertion thin wooden wedges into the pins of dovetail joints for a tighter fit. 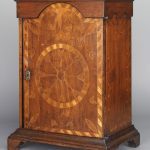 Quaker cabinetmakers, primarily working in southern Chester County, embellished some of their work with line-and-berry inlay. Their construction practices reflected common English construction methods, including a preference for nails rather than wooden pegs. Although well-documented examples are limited, consumers made a variety of choices about their furniture. In Philadelphia, affluent and status-conscious consumers were first and foremost concerned with acquiring suitably fashionable furnishings for their homes. It probably did not matter much to them how the objects were constructed, so long as they were well-built and suitable in overall appearance. Research into the city’s German population has suggested some preference for patronizing German craftsmen, but many of the best-documented objects made and owned by Philadelphia Germans show no trace of the owner or maker’s ethnic background. By furnishing their houses with fashionable furniture, elite Pennsylvania Germans were not rejecting their German heritage so much as they were expressing their social status. Increasing competition among craftsmen prompted the 1772 printing of Prices of Cabinet and Chair Work, an attempt by Philadelphia joiners to standardize retail prices and journeymen’s wages. Competition also spurred specialization and diversification. For example, Welsh Quaker cabinetmaker David Evans (1748-1819), who lived and worked at 115 Arch Street, began to batch-produce coffins and Venetian blinds in the late 1780s. Leonard Kessler (1736-1804), a German Lutheran who made furniture for leading German families such as the Muhlenbergs, became an undertaker and invested in a potash works. William Savery (1721/22-87) became one of the city’s foremost chair makers. While Savery made primarily slat-back, rush seat chairs, other craftsmen such as Thomas Gilpin (1700-66), Francis Trumble (c. 1716-98), and Joseph Henley Sr. (c. 1743-1796) specialized in Windsor chairs. Philadelphia became such a center of Windsor chair making that venture cargoes were shipped to other colonies and the Caribbean. 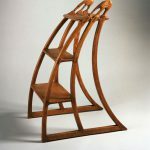 The decades following the American Revolution, 1790-1820, saw the rise of a lighter, classically-inspired style influenced by the publication of George Hepplewhite’s Cabinet Maker and Upholsterer’s Guide in 1788 and Thomas Sheraton’s Cabinet Maker’s and Upholsterer’s Drawing Book three years later. In Philadelphia, which served as the nation’s capital during the 1790s, leading cabinetmakers such as Adam Hains (1768-1846), Henry Connelly (1770-1826), John Aitken (?-1839), and Joseph Barry (1757-1838) readily adopted the new Federal style. An influx of French refugees also ushered in a vogue for furniture in the French taste. During the Federal period, Philadelphia also became home to a small but highly important group of piano makers, many of whom first trained as joiners. In 1789, German émigré Carl or Charles Albrecht (c. 1760-1848) built the earliest known American-made piano. A prolific maker, by 1798 Albrecht had produced at least ninety-three pianos in his shop at 95 Vine Street for clients including Peter Muhlenberg (1746-1807) of Philadelphia; Peter Dieffenbach (1755-1838) of Berks County, Pennsylvania; and Abner Lord (1760-1821), a Connecticut native who moved to Marietta, Ohio, about 1800. More than twenty examples survived into the twenty-first century in museum and private collections. Advances in transportation between 1820 and 1840, including improved roads, new canals, and the introduction of railroads, created new or expanded markets for goods throughout the United States. Philadelphia’s cabinetmaking trade grew significantly, propelled by more than 2,100 furniture makers, including 1,290 cabinetmakers, 300 chairmakers, and 250 turners. The output of these craftsmen—nearly 130,000 pieces of furniture, mostly chairs—reached far beyond Philadelphia to about fifty domestic cities and twenty abroad. New merchandising techniques, particularly wholesaling and furniture showrooms, also developed. Retailers could purchase ready-made furniture and ship it to distant locations for resale, while consumers could acquire furniture that was already made rather than ordering, and waiting, for pieces made to order. With increasing production, the traditional apprenticeship system began to erode. 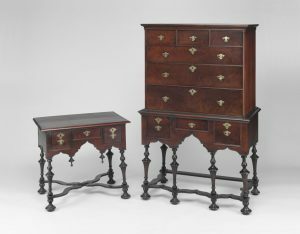 Master cabinetmakers increasingly directed the work of journeymen and apprentices rather than making furniture themselves. Conflicts over wages and increasing use of unskilled labor led to strikes in 1796 and 1825. In 1829, the Society of Journeyman Cabinetmakers, founded in 1806 as a benevolent organization, revised its constitution and pushed for set minimum wages and an eleven-hour working day. Unsuccessful in these efforts, the society founded a cooperative furniture wareroom in 1834; it soon became one of the largest furniture retail stores in Philadelphia. Immigration also continued to shape the trade. Beginning in the 1830s, a new influx of Germans included many skilled cabinetmakers; by 1850, more than one-third of Philadelphia’s cabinetmakers were German-born. Foremost among them was Daniel Pabst (1826-1910), who helped usher in a vogue for curvilinear, rococo revival furniture. The Philadelphia furniture industry prospered through the late 1800s, but it faced increasingly stiff competition from other regions, including New York, North Carolina, and Michigan. With its highly diversified array of small- to medium-scale industries, Philadelphia became known as the “Workshop of the World” by the early 1900s. But as mass production and marketing gave consumers access to standardized, inexpensive goods made by domestic and global manufacturers, the city’s furniture industry declined and virtually disappeared by the mid-1900s. By the 1970s even the Philco company, renowned for making high quality audio systems housed in “Mastercraft” furniture cabinets, switched to cheaper wood composites and faux wood components made of vinyl and plastic. The radios were also replaced with imports from Taiwan. Not all furniture making switched to an industrial scale. Followers of the Arts and Crafts movement, part of a larger reaction to the industrial revolution that emerged in the late 1800s, advocated for a return to handcraftsmanship. 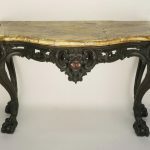 In the early 1900s, members of the Rose Valley Association (a utopian living experiment in Media, Pennsylvania) made furniture—much of it with heavy carving in the Gothic style—for their own use and to sell to wealthy clients in the Greater Philadelphia area. Several decades later, craftsmen such as Wharton Esherick (1887-1970) and George Nakashima (1905-1990) found success making studio furniture in the mid-1900s and beyond. Their innovative designs combined naturalistic forms and use of figured woods with traditional joinery techniques—continuing Philadelphia’s longstanding heritage in cabinetmaking. Catalano, Kathleen M. “Cabinetmaking in Philadelphia, 1820–1840: Transition from Craft to Industry.” In American Furniture and Its Makers, edited by Ian M.G. Quimby, 81–138. Winterthur Portfolio, vol. 13. Chicago: University of Chicago Press for the Henry Francis du Pont Winterthur Museum, 1979.
Cooper, Wendy A. and Lisa Minardi. Paint, Pattern & People: Furniture of Southeastern Pennsylvania, 1725–1850. Winterthur, Del. : The Henry Francis du Pont Winterthur Museum, 2011. Dorman, Charles G. Delaware Cabinetmakers and Allied Artisans, 1655–1855. Wilmington: Historical Society of Delaware, 1960). Evans, Nancy Goyne. American Windsor Chairs. New York: Hudson Hills Press for the Henry Francis du Pont Winterthur Museum, 1996. Heckscher, Morrison H. and Leslie Greene Bowman. American Rococo, 1750–1775: Elegance in Ornament. New York: Harry N. Abrams, Inc., 1992. Hornor, William Macpherson Jr. Blue Book, Philadelphia Furniture, William Penn to George Washington, With Special Reference to the Philadelphia-Chippendale School. Philadelphia: Privately published, 1935. Killian, Jacquelann. “United by Water: Cabinetmaking Traditions in the Delaware River Valley, 1670–1740.” Master’s thesis, University of Delaware, 2014. Lindsey, Jack L. et al. Worldly Goods: The Arts of Early Pennsylvania, 1680–1758. Philadelphia: Philadelphia Museum of Art, 1999. Stiefel, Jay Robert. “Philadelphia Cabinetmaking and Commerce, 1718–1753: The Account Book of John Head, Joiner.” American Philosophical Society Library Bulletin 1, no. 1 (Winter 2011): 1–165. Talbott, Elizabeth Page. “The Philadelphia Furniture Industry, 1850 to 1880.” Ph.D. dissertation, University of Pennsylvania, 1980. Beckerdite, Luke, ed. American Furniture. Hanover, N.H.: University Press of New England for the Chipstone Foundation (see especially 1996, 1998, 2001, 2002, 2004, 2011, 2013, 2014). The Magazine Antiques (see especially issues of May 1984; September 1985; May 1987). The 1772 Philadelphia Furniture Price Book. Philadelphia: Philadelphia Museum of Art, 2005. John Head account book, 1718–53, George Vaux Papers, American Philosophical Society, 104 S. Fifth Street, Philadelphia. Decorative Arts Photographic Collection and Solomon Fussell account book, 1738–49 (microfilm), Joseph Downs Collection of Manuscripts and Printed Ephemera, Winterthur Library, 5105 Kennett Pike, Winterthur, Del. Cliveden, 6401 Germantown Avenue, Philadelphia. Winterthur Museum, 5105 Kennett Pike, Winterthur, Del. Berks History Center, 940 Centre Avenue, Reading, Pa.
Wright’s Ferry Mansion, 38 S. Second Street, Columbia, Pa.
Metropolitan Museum of Art, 1000 Fifth Avenue, New York, N.Y.
William Trent House, 15 Market St, Trenton, N.J.
Monmouth County Historical Association, 70 Court Street Freehold, N.J.
Yale University Art Gallery, 1111 Chapel Street, New Haven, Conn.
Chipstone Foundation, selections on display at the Milwaukee Art Museum, 700 N. Art Museum Drive, Milwaukee, Wisc. My great great grandfather was Stanislaus Henkel of Chestnut Hill Philadelphia Area. He made furniture in the mid to late 1800s. I have been unable to find information on him and his works on-line. Some of his pieces are on display at Asa Parker Mansion in Jim Thorpe. Do you have any information? I recently purchased a birdcage back Windsor chair with rain gutter seat. Branded on bottom R. Walt Philadelphia after Walt it goes light can’t read. Anyone have any info?